Flu season starts in October, and the UF Student Health Care Center is already in gear, arming students, faculty and staff against the virus. More than 500 people received flu shots during a mass vaccination event on the center’s front lawn Sept. 20. Raquelle Newman, a junior from Fort Lauderdale who was passing by, rolled up her sleeves for a shot administered by nurse Lily Hummer, R.N. Ever since a severe case of the flu landed the health education and behavior major in bed for four days during her freshman year, she hasn’t hesitated to get an annual flu shot. 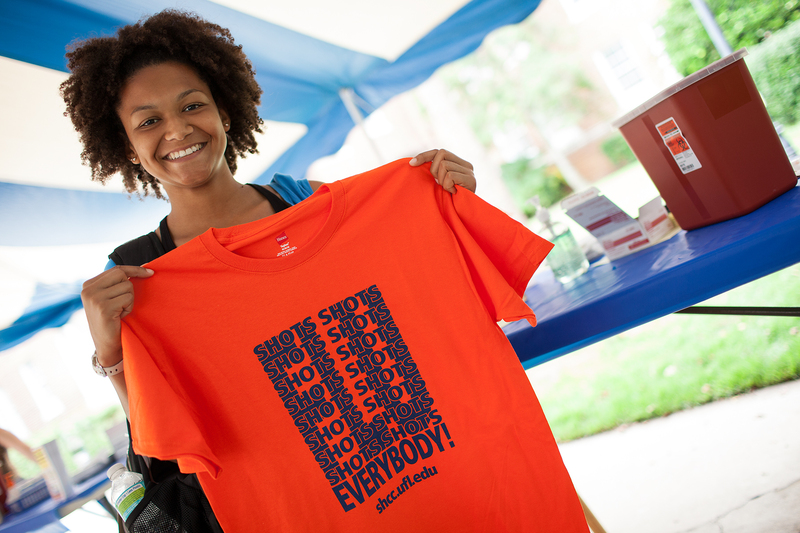 Newman scored an orange and blue “Flu Shots, Shots, Shots, Everybody!” T-shirt for being among the first to be vaccinated. The event was just one of the Student Health Care Center’s many flu vaccination outreach events across campus for students, faculty and staff being held between now and November. Some students registered online in advance, and many more, like Newman, simply dropped by to get their shots. “I think it was a huge success, and we were able to vaccinate a large number of people in a relatively short period,” said Phillip Barkley, M.D., director of the UF Student Health Care Center. The Centers for Disease Control and Prevention recommends that everyone 6 months and older receive a flu shot each year. Not only does the shot protect people from becoming sick, it prevents them from infecting others. “If you think about a college campus, with people in classrooms and residence halls — that just compounds the transmission issue further,” Barkley said. Health care workers who are vaccinated protect their patients as well. “The benefits to the campus and society are just huge, and we’re working hard to help protect the UF campus and our UF family,” Barkley said. Some people who have had sniffles and aches recently might feel that they’ve had the flu and so can forego vaccination. But not so fast, Barkley said. 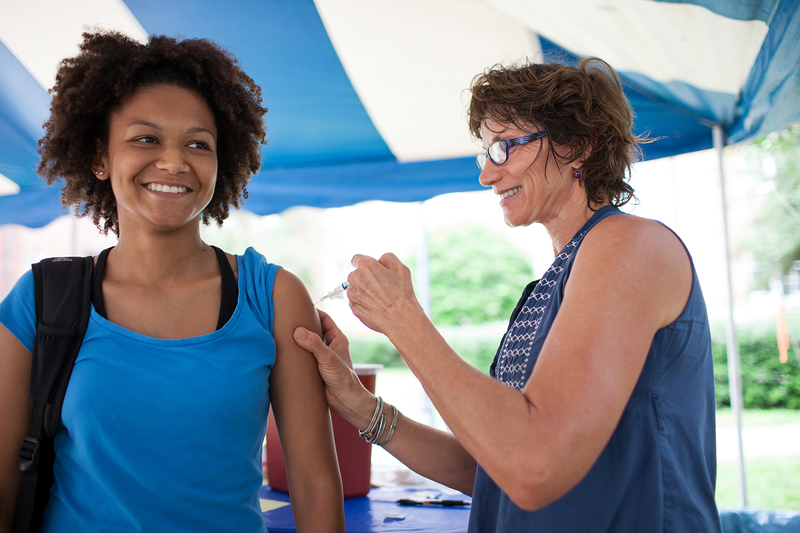 Vaccination outreach efforts continue across campus for the next several weeks, at the Founders Gallery, the Shands at UF Atrium and the Reitz Union. Free flu shots will also be offered to all UF employees Oct. 23 at Ben Hill Griffin Stadium during the UF Employee Benefits Fair. For more details on where and when you can get a free flu shot, visit the UF Student Health Care Center website. Then simply show up with your ID and roll up your sleeves.